The engaging trumpeter, singer, and composer Bob Merrill has a Boston gig I think you would like. It’s at the Regattabar on February 18, 2016 — beginning at 7:30 PM: details here (order tickets, etc.) as well as a nice writeup of Bob and the band if they are not familiar to you. It’s a CD release show for CHEERIN’ UP THE UNIVERSE, and the band is a fine one: Bob, trumpet / vocals; Russ Gershon, reeds / flute; Freddy Bryant, guitar; Laurence Hobgood, piano; John Lockwood, string bass; George Schuller, drums; Vicente Lebron, percussion. and Bob’s YouTube channel is here. When Bob’s CD came out, I enjoyed it and wrote this. So if you are in the Boston area or plan to be, consider joining Bob for an evening of his particular light-heartedness. 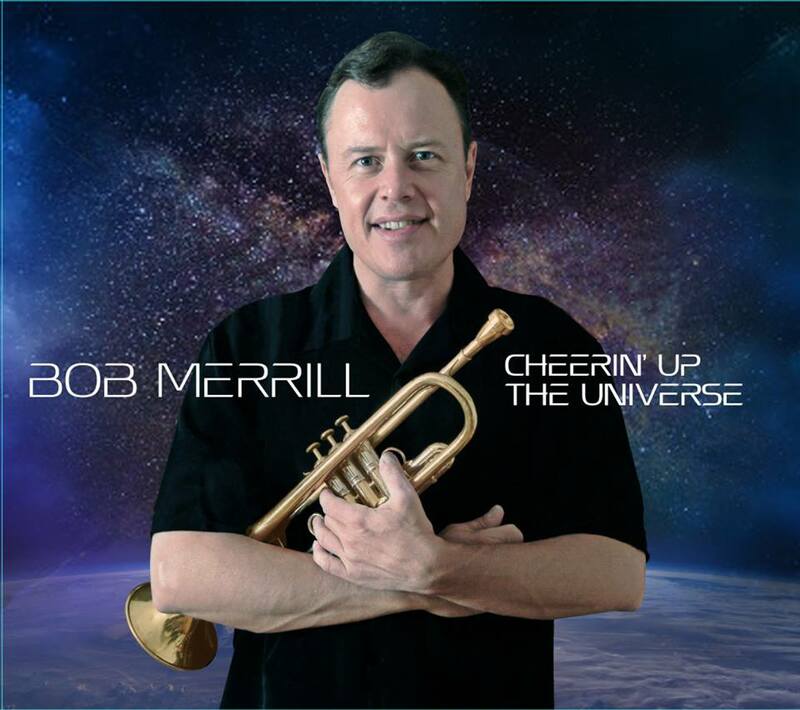 If anyone can improve the cosmic disposition, trumpeter / singer / composer Bob Merrill has a good shot at it. He has the right attitude for sure. On his new CD, he’s got the happy assistance of pianists John Medeski, Matthew Fries, and John Van Eps; guitarist Drew Zingg, string bassist / vocalist Nicki Parrott, drummer George Schuller, percussionist Vicente Lebron, reedman / flautist Russ Gershon, and special guests: tenorist Harry Allen, the legendary trombonist Roswell Rudd, and singer Gabrielle Agachiko. The CD itself is a fascinating hybrid — part post-bop Blue Note jazz with its rough edges smoothed off, part cheerful high-level vintage pop that would have sold millions in its own time and will no doubt attract new listeners in 2015. The range is deliciously broad, the results convincing — from Paul Simon’s FEELIN’ GROOVY (a sweet witty duet for Bob and Nicki) to James Taylor and Randy Newman . . . and the only jazz version of Pharell Williams’ HAPPY that I expect to have on my shelves. There are some delicious surprises here — triumphs of imagination. I won’t spoil all the surprises, but my current favorite is a sharp-edged version of Randy Newman’s POLITICAL SCIENCE (LET’S DROP THE BIG ONE) that features Roswell Rudd, mock antique honky-tonk piano flourishes from Medeski, as Bob croons the dire lyrics over a twenty-first century “Dixieland” frolic. It made me think, “What if Tom Lehrer had had the chance to record with George Wein’s Storyville band, say, Doc Cheatham, Vic Dickenson, and Pee Wee Russell?” Now, there’s an auditory miracle we can only imagine — thank you, Bob! Even if the reach of this CD is narrower, and it cheers up only terrestrial listeners, it’s still a worthy enterprise. Reach for this CD in the morning instead of your smartphone, perhaps. Here (that’s Bob’s website) you can hear sound samples, check out Bob’s other CDs, and — cosmically — purchase this one. You can follow Bob and learn more about his music here and here. 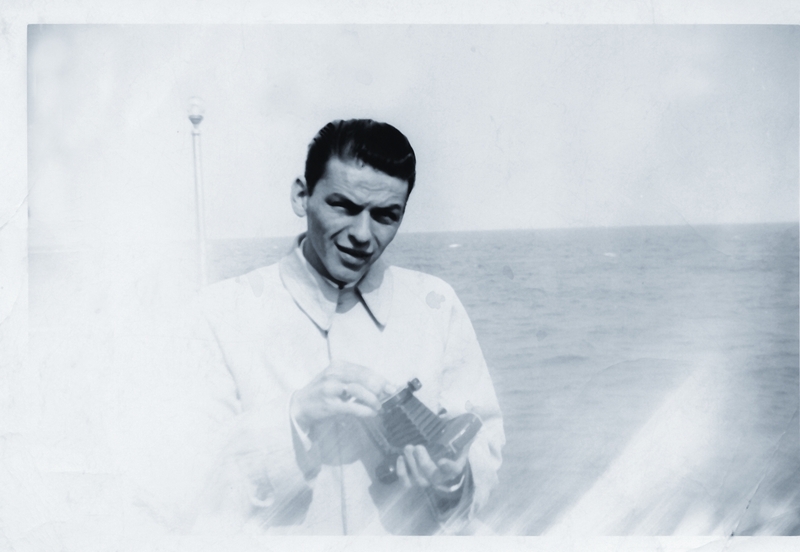 “Frankie-Boy” is what Lester Young called Frank Sinatra — when, in the last years of his life, Lester would sit in his room, playing Sinatra records endlessly. But this post is not about Lester (even though yesterday was his birthday). No, it is about Frankie-Boy. What follows is a generous offering from Bob Merrill, trumpeter and singer — who also happens to have had Joe Bushkin as a father-in-law . . . thus stories as part of the family lineage. And this photograph, never before seen. I found a bunch of snapshots in Joe Bushkin’s closet, this among them. Joe casually informed me that they were photographed by Buddy Rich, and somehow Joe wound up with them. He never got around to returning them, no surprise there. It reminds me of a great story Joey used to tell regarding Frank’s annoyance that Buddy was playing too loud behind his vocals. This was at a time when the bobby-soxers were going wild to the point that Dorsey started skipping the first-chorus trombone statement of the melody before Frank’s vocal, electing to begin with Sinatra, to the delight of the fans. One night, Frank was so incensed by Buddy’s loudness, he confronted him backstage after the show. Suddenly, switchblades were drawn, and Joe and other band members intervened to break up the scuffle. Tommy Dorsey ran in and yelled to his drummer and vocalist, “If anything happens to those uniforms, I’m going to dock your pay!” Priceless, if you ask me. Posted in "Thanks A Million", Bliss!, Generosities, Jazz Titans, Pay Attention!, That Was Fun!, The Heroes Among Us, The Real Thing, The Things We Love, Wow!